What is a KOHO Joint Account? Wondering if you can share an account? Or how to invite someone to a Joint Account? Read on for all the features you need to know. Now you'll be able to easily share finances with a spouse, roommate, sibling, or friend. 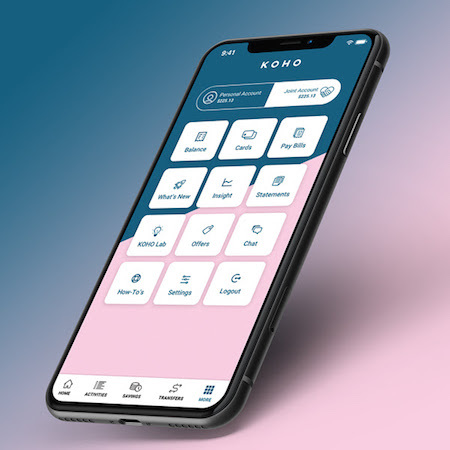 No romantic involvement necessary 😉 KOHO's new Joint Accounts are a free and easy way to share expenses with anyone you want. We're trying to make joint saving and spending as easy as possible. You can set shared savings goals and get spending notifications when either of you goes shopping. It takes just minutes to set up. If you're a first time KOHO user signing up for a Joint Account, you'll get a Personal account too. You can easily toggle between your Joint and Personal Accounts in-app and you won't need a separate login/password. What can I do with a Joint Account? KOHO Joint Accounts offer the same convenient spending and saving features that you're used to on your Personal Account. This includes a no-fee account with a Virtual Card, an easy way to pay bills, seamless pre-authorized debits, free e-Transfers, and instant money transfers to other KOHO users. All the savings features such as Goals, PowerUps, and RoundUps are also available for your Joint Account. To view or set up these features on your Joint Account, all you need to do is go to the 'More' screen and tap on 'Joint Account' to toggle between accounts. How do I invite someone to create a Joint Account with me? You will then be prompted to enter their email address. They do not have to be a current KOHO user. We'll give them all the info they need in an invitation email. I've received an invitation, what should I do? The fastest way is to click on the 'Get Joint Account' button in the invitation email you should have received. Another method to accept a Joint Account invitation is by tapping the 'More' tab > 'Joint' > 'Accept an Account Invite.' Then, enter your Joint invite code displayed in the Joint invitation email. Will I receive another physical card? Yes. Each partner will receive a separate Joint card, in additional to their own Personal card. Is there a Joint Virtual Card so I can start shopping online? Yep. Your Joint Virtual Card is immediately available after you have created the Joint Account. Go to the 'More' tab > 'Cards'. You'll both have your own Joint Virtual Card linked to a Joint Account balance, as well as your own Personal Virtual Card linked to your Personal Account balance. How do I load money onto my Joint Account? The easiest method is to transfer funds from your Personal Account. To do this, tap the 'Transfers' tab > 'Transfer Between My Accounts'. You can also directly load your Joint Account by using Payroll Direct. Learn more about how to load your Joint Account. How can I see information related to my Joint Account, such as my balance or transactions? After you have successfully created a Joint Account, tap the 'More' tab and click on 'Joint Account' in the switcher on the screen. By navigating to other pages, you can now see Joint Activity or Joint Savings. To see your Personal information, go back to the More screen and click on 'Personal Account' in the switcher. Can my Joint partner see my Personal transactions or other information? Nope. Everything in Personal stays personal. All of your Personal transactions, savings, balances, and activity are not visible to your Joint partner. Only Joint-related activity is visible to your Joint partner. My Joint partner only wants a Joint Account, can they do that? No, your Joint partner will always have their own Personal Account in addition to the Joint Account. The simplest thing for them to do is to simply not use their Personal Account if they don't want to. How many Joint Accounts can I have and how many people can I share a Joint Account with? Each person can only have one Joint Account. Additionally, you can only have one other partner on a Joint Account so that only two people are sharing a Joint Account. 1 +1 = Joint Account. Who’s the primary on the account? Can I close a Joint Account? Yes. Any one of the two Joint members can close a Joint Account since you both have equal power. Consent is needed from only one party to close the entire Joint Account. See our Cardholder Agreement. So again, make sure you're on the same page as the person you're sharing an account with. What happens to the funds when a Joint Account is closed? The person initiating the account closure request will need to first transfer all the Joint funds into their Personal Account. Can Joint Accounts be used by children? Children need to be the age of majority (18 or 19, depending on your province) to use any KOHO accounts at this time, including Joint Accounts. Can Joint Accounts be used for my business? No. You can only use Joint Accounts for personal use.